For appetizer, or main course for lunch accompanied with a Caesar salad on the side, I highly recommend their super thin slice pizza with paper thin slices of pears, Gorgonzola cheese and truffles. You can serve this pizza as an appetizer for up to 6 people; or you can have it as your main course (because I love it) with a salad on the side. You have to order their Alfredo Fettuccine. After all, THIS is a signature dish. The recipe came from Rome. It's the best Alfredo Fettuccine I've ever had. Pictured on the right is a dessert from their menu that I've never tasted elsewhere. It's called Fennel Tart drizzled with chocolate and caramel sauce, served with Sambucca ice cream on the side. I happen to love fennel in my salad or with pork. This pastry has lots of sweet fennel inside. I think it's a healthy dessert! This Tiramisu is soooo good! It's addictive. It's one tiramisu I love! It's summer time and it's steamers time in the New England Sea coast. To cook steamers, buy them fresh from a reliable purveyor or fishmonger. 2TB of melted butter in each ramekin for each person. (Serves 4) for appetizer or 2 for lunch. Pour the water in a large stock pot. Soon as it boils, put all the steamers in. Cover the pot with the lid and cook for about 5-10 minutes. As soon as the steamers open, they are cooked. Steamers have a "skin" around the valve and a tail that you have to skin before you eat. The skin around the valve keeps the juice inside the steamer. Some skins break. You may also use French Country bread. As pictured on the left, I used raspberries. First you spread mascarpone or clotted cream on toasted sliced bread. Sprinkle with confectioner's sugar and serve. Above, I used blackberries over mascarpone and drizzled it with confectioner's sugar as well. I served with prosciutto on another piece of toast drizzled with olive oil. Makes a great quick breakfast! This week, I came across a large piece of pork belly with skin at the special meat market I go to. I've been searching for the right porchetta for a few years now and have come across a couple of places that hit or miss. And this is my 3rd attempt to make a juicy but crunchy skinned roast pork full of flavor. First, I bought a 4 lb meaty pork belly with skin. If you bought the pork belly already tied in strings, remove strings and season well with the ingredients above. 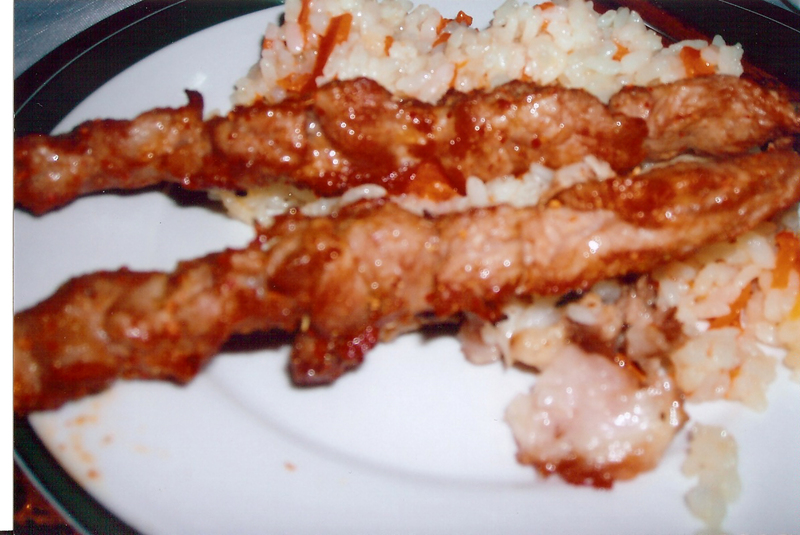 Roll the Pork and tie it with a strings tightly. Season the outside well with more minced garlic, salt and pepper. Brush generously with olive oil. Place roast on top of rack with hot water in pan. (bain marie). Bake at 330 degrees F oven for 1 hour seam side up. Then turn pork with seam side down and bake more for about 2 hours for a 4lb pork belly meat to get the skin crisp. A successful pork roast has crisp skin and very juicy meat as pictured above. Harold Dieterle III is an American chef best known as the winner of Season 1 of Top Chef. His signature dish is spicy duck meatballs. He was brought up as an Italian-American watching and assisting his mother prepare traditional Sicilian Sunday suppers in their Long Island home. 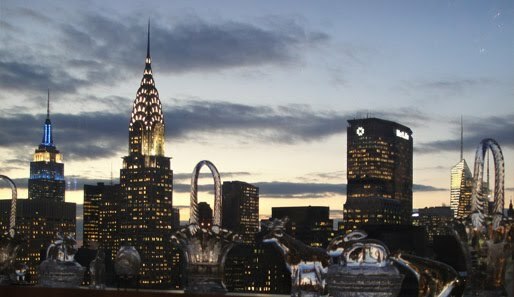 He opened Kin Shop in October of 2010 on Sixth Avenue in the West Village. As usual, it was 2:30PM by the time I finished showing properties and I was starving. (I'd rather starve and eat at home than grab anything to stuff myself) Therefore, since I wasn't far from this restaurant, I decided to walk a few more blocks and caught them a few minutes before they closed. I was in for a treat and another new discovery. I chose the Crunchy Sprout and Bibb Salad with sunflower seeds and plum-peppercorn vinaigrette and not only was it delicious, it was definitely healthy!!! The main course they recommended was the Beef Brisket Madtarbok with turmeric, cucumber relish and watercress. (It was more like a very good empanada with a delicate thin crust) The cucumber relish was a good compliment and so was the slightly tart watercress salad. This was such a delicious choice for dessert for a summer day where I've been walking all over SoHo and the Village to show properties. This calamansi sorbet hit the spot!! Scroll down to reserve through open table if you wish. If you're ever in Shanghai, I recommend visiting this restaurant. It was recommended to us by a Shanghai-born Australian who was our maitre-d at M on the Bund; a restaurant in Shanghai. 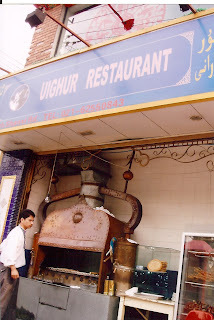 Uighur traditional food. Uighur people are a large minority group making up most of the population of China's far west Xinjiang province. Their looks and food are similar to central Asian. The cuisine focuses on lamb and mutton. This was a delicious and mutton dish. Although they cooked it outside on the grill, it was tender and juicy with very little charred taste. This version of the shish kebab had Asian flair. The rice was a sticky and very moist, full of flavor.